Tamar Braxton Comes For K.Michelle On Twitter Over Vocal Shade? Tamar Braxton has always been confident in her vocal abilities, and she’s slightly annoyed that K.Michelle may have prompted people to doubt her. It was apparent that Tamar had pipes from the moment that “Love & War” first hit the public and blessed our ear drums. However, when her voice began to fail her when she experienced some problems with her throat last year. K.Michelle mostly kept mum about her rival’s vocal struggles with the exception of a tweet where she suggested that Tamar may be experiencing karma. That was months ago, but K.Michelle has shaded Tamar’s looks and vocals a few times since then. 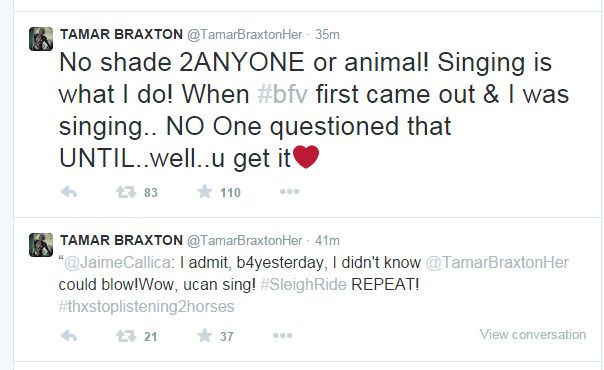 Now, Tamar has made the latest subtle jab in their never-ending feud. K.Michelle has kept her disdain for Tamar fairly low-key this month. That could be because she’s been so busy talking about Idris Elba. We’ll see how K reacts to Tamar’s comments, though, because that was surely some shade.